I would love it if Wilmington had a Jazz Club/restaurant. I dream of owning a Jazz Club and the historic downtown Wilmington area would be the perfect spot for it. But until that happens, Wilmington always has lots of jazzy things going on and here are a few for January and February. I would like to introduce the Cape Fear Jazz Society, of which we are supporters, founded in 1997 offering great year-round jazz concerts around the Wilmington area. The fall/winter concert series offers Jazz at the CAM the first Thursday of each month through April. The fourth season continues Thursday, January 9 at 6:30 with Gregg Gelb and Jazzet featuring pianist/vocalist Steve Wing who bring their New Orleans, Swing, Bebop influenced jazz to the series. See www.cameronartmuseum.com for more information. Also their popular summer series, Jazz at the Mansion, is enjoyed at The Bellamy Mansion in warmer weather, see www.bellamymansion.org. Thalian Hall is host to the occasional jazz artist as well. On Friday, January 24 at 8 pm Ruthie Foster will be on the main stage delivering flourishes of folk, gospel, jazz and country into her music. “With frequent comparisons to such legends as Aretha Franklin and Ella Fitzgerald, Ruthie has a combustible blend of musical diversity”. Contact www.thalianhall.org for tickets. Jazz lovers are eagerly anticipating the 34th Annual North Carolina Jazz Festival will hit Wilmington February 6, 7, & 8, 2014. This always sells out. The Thursday night showcase is only $35 and is from 7:30 to 10:15. The theme is Styles of Jazz. The first set opens with Brazilian singer Maucha Adnet & friends with a Tribute to Antonio Carolos Jobim. The second set features Wilmington’s own Grenoldo Frazier, interpreting Louis Armstrong and will close with a traditional jazz jam of All Stars led by cornetist Ed Polcer. Wow! And military guests are only $25. Check out the full weekend schedule at www.ncjazzfestival.com. Even while strolling downtown on Front Street you will hear the sweet sounds of saxophonist Glen McRae. McRae has played with some of the biggest names in jazz such as Charlie “Yardbird” Parker and Clarence Clemmons and more. 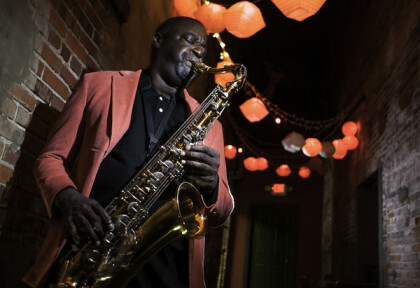 Come experience the jazz scene in Wilmington soon and plan to stay at C.W. Worth House Bed and Breakfast in the Historic District. This entry was posted in wilmington attractions by Margi Erickson. Bookmark the permalink.